^ 2.0 2.1 2.2 Bird, William L.; Rubenstein, Harry R. Design for Victory: World War II posters on the American home front. Princeton Architectural Press. 1998: 78 [2013-06-23]. ISBN 1-56898-140-6. ^ Ehrlich, David A.; Minton, Alan R.; Stoy, Diane. Smokey, Rosie, and You!. Hillcrest Publishing Group. 2007: 62 [2013-06-23]. ISBN 1-934248-33-9. ^ Heyman, Therese Thau. Posters American Style. New York: National Museum of American Art, Smithsonian Institution, in association with Harry N. Adams, Inc. 1998: 106. ISBN 0-8109-3749-2. ^ 6.0 6.1 Harvey, Sheridan. Rosie the Riveter: Real Women Workers in World War II. Journeys & Crossings. Library of Congress. 2010-07-20 [2013-06-23]. （原始内容存档于2013-05-17）. 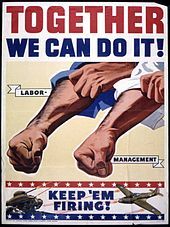 ^ Work—Fight—Give: Smithsonian World War II Posters of Labor, Government, and Industry. Labor's Heritage (George Meany Memorial Archives). 2002, 11 (4): 49. ^ We Can Do It!. Smithsonian Institution. [2013-11-28]. （原始内容存档于2013-10-29）. Search results for catalog number 1985.0851.05. Cushing, Lincoln; Drescher, Tim. Agitate! Educate! Organize! : American Labor Posters. ILR Press/Cornell University Press. 2009. ISBN 0-8014-7427-2. ^ 11.0 11.1 11.2 11.3 11.4 11.5 McLellan, Dennis. Geraldine Hoff Doyle dies at 86; inspiration behind a famous wartime poster. Los Angeles Times. 2010-12-31 [2013-06-23]. （原始内容存档于2012-09-20）. ^ Young, William H.; Young, Nancy K. World War II and the Postwar Years in America: A Historical and Cultural Encyclopedia 1. ABC-CLIO. 2010: 606 [2013-06-23]. ISBN 0-313-35652-1. ^ Weatherford, Doris. American Women during World War II: an encyclopedia. Taylor & Francis. 2009: 399 [2013-06-23]. ISBN 0-415-99475-6. ^ 14.0 14.1 Williams, Timothy. Geraldine Doyle, Iconic Face of World War II, Dies at 86. The New York Times (The New York Times Company). 2010-12-29 [2013-11-13]. （原始内容存档于2013-11-13）. ^ 15.0 15.1 Memmot, Mark. Michigan Woman Who Inspired WWII 'Rosie' Poster Has Died. NPR. 2010-12-31 [2013-06-23]. （原始内容存档于2013-05-05）. ^ Schimpf, Sheila. Geraldine Hoff Doyle. Michigan History Magazine (Michigan Department of State). 1994, 78: 54–55. ^ Sharp, Gwen. Myth-Making and the 'We Can Do It!' Poster. The Society Pages. 2011-01-04 [2013-11-28]. （原始内容存档于2013-10-23）. ^ Coleman, Penny. Rosie the Riveter Image. PennyColeman.com. 2010-12-30 [2013-06-23]. （原始内容存档于2011-04-28）. ^ Brennan, Patricia. Poster Art for Patriotism's Sake. Washington Post Magazine. 1982-05-23: 35. ^ Endres, Kathleen L. Rosie the Riveter. (编) Dennis Hall, Susan G. Hall. American icons: an encyclopedia of the people, places, and things 1. Greenwood. 2006: 601 [2013-06-23]. ISBN 0-275-98429-X. ^ 1999–2000 Highlights. 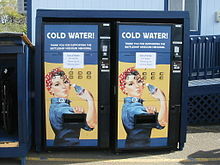 Rosie The Riveter Memorial Project. Richmond, California: Rosie the Riveter Trust. 2003年4月 [2013-06-23]. （原始内容存档于2012-03-28）. ^ Women Support War Effort. United States Postal Service. [2013-06-23]. ^ Women On Stamps (Publication 512) (PDF). United States Postal Service. 2003年4月 [2013-06-23]. （原始内容 (PDF)存档于2013-04-20）. ^ Treasures of American History: The Great Depression and World War II. National Museum of American History. [2013-06-23]. （原始内容存档于2012-10-19）. ^ Wade, Lisa. Sociological Images: Trivializing Women's Power. The Society Page. 2007-10-22 [2013-06-23]. （原始内容存档于2013-06-22）. ^ Paul, Cindy. Masterpieces of Jelly Bean Art Collection at the Children’s Museum. Indianapolis, Illinois: Funcityfinder.com. 2011-04-12 [2013-05-29]. （原始内容存档于2012-10-07）. ^ Cumings, Kristen. We Can Do It!. Jelly Belly Bean Art Collection. Jelly Belly. [2013-05-29]. （原始内容存档于2012-10-03）. ^ Phoenix. We Can Do It!. Flickr. 2010-06-29 [2013-06-23]. （原始内容存档于2012-10-07）. ^ Hellqvist, David. Australian President, Julia Gillard. AnOther Magazine. 2010-07-27 [2013-06-23]. （原始内容存档于2010-07-31）. ^ Dama Design. Julia Gillard. Tumblr. 2010-07-08 [2013-05-29]. （原始内容存档于2012-10-07）. ^ Phoenix. We Can Do It!. Flickr. 2011-03-12 [2013-06-23]. ^ Phoenix. We Can Do It!. Flickr. 2010-07-02 [2013-05-29]. ^ Phoenix. She Did It! (TOO SAD). Flickr. 2012-01-23 [2013-06-23]. ^ Table of Contents. Utne Reader. January–February 2011 [2013-06-23]. （原始内容存档于2012-08-31）. ^ untitled. Utne Reader editorial blog. Utne Reader. 2011-01-03 [2013-06-23]. （原始内容存档于2013-06-23）. ^ Landekic, Lola. Captain America: The First Avenger. Art of the Title. 2011-08-30 [2013-06-23]. （原始内容存档于2013-01-25）. ^ The Story of the Ad Council. Ad Council. [2013-05-29]. （原始内容存档于2007-02-16）. ^ 39.0 39.1 Conlon, Peggy. Happy Birthday Ad Council! Celebrating 70 Years of Public Service Advertising. Huffington Post. 2012-02-13 [2013-06-23]. （原始内容存档于2012-02-16）. ^ HelpsGood Develops 'Rosify Yourself' App for Ad Council's 70th Birthday. HelpsGood. 2012年2月 [2013-06-23]. （原始内容存档于2013-06-23）. ^ Veres, Steve. Plaza sign of the day: Matt as Rosie the Riveter. Today (MSN Allday Today). 2012-02-13 [2013-06-23].